This is a slightly revised reprint of the article published on the Mirage Bookmark website under the column 'The Secret Life of Bookmarks', online between March 2010 and July 2011. The 1928 Olympic Games was held in the Dutch city of Amsterdam. These games marked a major step in achieving gender equality. For the very first time, women's athletics events were included in the program despite objection from Coubertin, the founder of the Olympic Games, and Pope Pius IX. The Shell Oil Co., Holland, issued on this occasion a double-sided advertising bookmark printed on card. The bookmark has the size of 154 x 55 mm and shows on the one side a discus thrower in silhouette along with the coats of arms of the Kingdom of the Netherlands and of Amsterdam. The reverse side shows a promotion for the company Shell in the form of an advertising pillar. See Fig. 1. The bookmark from 1928 is meanwhile a popular collector's item and had in 2009 when this paper was first published a value of Euro 35 - 50, and is as per today worth around Euro 100, depending on the state of preservation. The bookmark is today very rare to find. In the 1970s a reprint of the bookmark was produced by the Shell company which looks very similar to the original and is nowadays rather common, however, getting gradually rare as well. The value of a reprint bookmark in good condition can be estimated to Euro 20 - 25 today. 1. The paper of the genuine bookmark is thinner than the one of the reprint. Of course, this can only be determined by holding both in the hand. 2. The print of the original shows more modest colours and has a matt finish in contrast to the reprint which has more vivid colours and most importantly a slight glossy shine on the surface. 3. Further significant difference is the green colour around the words OLYMPIADE AMSTERDAM which on the reprint is a bright green, although it differs also in colour tone between individual reprints probably originating from different print batches. In contrast, on the original the colour is a dark dull green near black. 4. 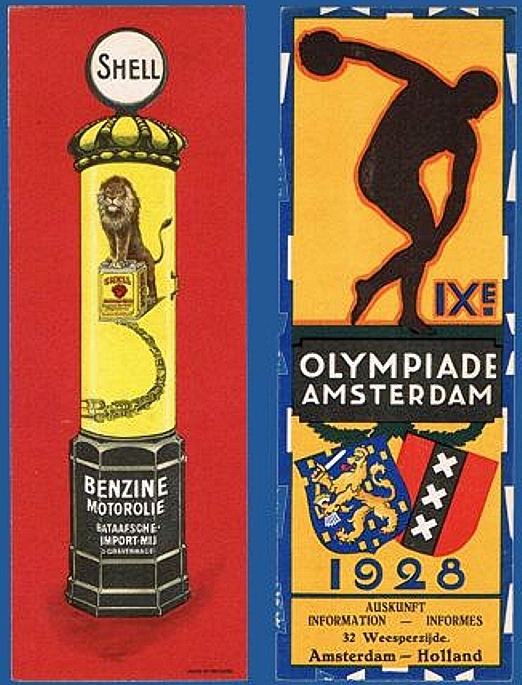 Another noticeable difference can be seen on the advertising pillar above the word BENZINE where the pillar goes from the hexagonal to the circular profile. On this horizontal step there is a grey hatched shading which on the reprint can hardly be seen. 5. The shadow of the pillar on the red ground is much more pronounced on the original whereas on the reprint it is very weak. Coming across imitations of bookmarks may be an annoying experience for collectors, however, a reprint is also a reverence for a bookmark which seems to be important enough to justify such a venture.